With spring’s arrival, you’d be wise to take a leaf out of Mother Nature’s changing colour palette and stroll into the season wearing our edit of the must-have hues. There are endless rules surrounding the incorporation of colour into an ensemble, and it is often easier to play it safe with classic hues – especially when it comes to tailoring. However, adding a touch of colour can serve as an expression of identity and, if done right, demonstrates sartorial flair. Through the winter months, red is a charming, unobtrusive, warm hue to break up my outfits which tend to be grey, navy, country green or a mix of the above. Now that the weather is beginning to be a bit more agreeable, louder colours become less out of place and sky blue is my favourite. A splash of colour should, ideally, not be a one-off if you can avoid it – not just a pair of socks, or just a pochette, but a coordination of many facets of your outfit. In the case of sky blue, don’t go over the top; a sky blue blazer has something very Peter Rabbit about it. The amalgam of colour should be noticed and works particularly well at a wedding if you throw in a sky blue waistcoat. Exercise considered caution and you will be rewarded, but under no circumstances be too frightened to try. If nerves are the issue, these three with anything navy will ease you in with aplomb. As Picasso once said, "Colours, like features, follow the changes of the emotions," and I for one am feeling upbeat now that spring is operational. It only follows then that I rinse my sartorial brush of autumnal hues and give my wardrobe a new lick of transitional pastels. One could hardly call London balmy in May, which is why this light pink fine-gauge Merino knit by Richard James ticks all the boxes. The hue is extremely versatile and with just the right dosage of continental flamboyance. While it pairs with most colours, it makes a fine dressed-down foil to Chester Barrie's blue mouline suit (but can be styled with chinos or tailored shorts later in the year). Finish off the look with my new obsession; Carmina's burgundy cordovan leather double monks. A wardrobe full of navy, black and grey makes getting dressed in the morning an easy task, but doesn’t necessarily shout creativity. In lieu of obvious displays of colour, an easy way to show a veritable palette, and prove you’re not completely bland, is through subtle touches. 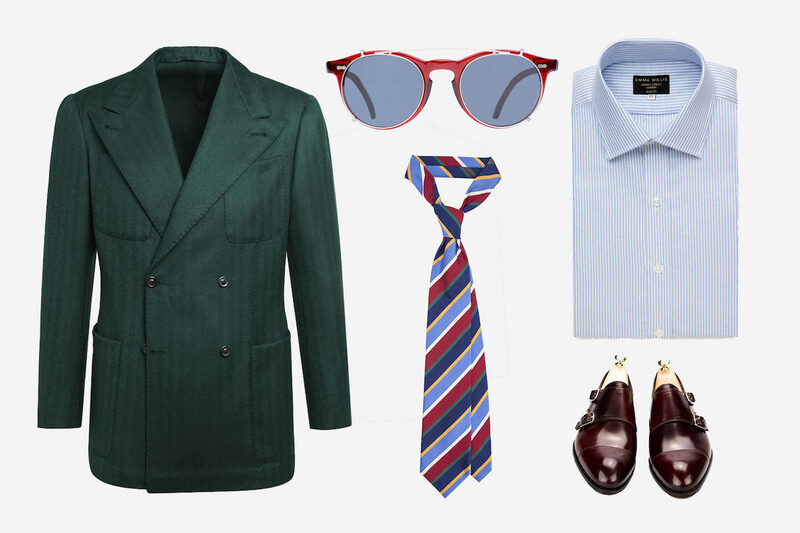 Something as easy as a lined jacket or vibrantly-hued sock, which will show a flash of colour with movement, or a pair of sunglasses to round-off an outfit. Look to the likes of Rubinacci, New & Lingwood and The Bespoke Dudes Eyewear, who are all well-versed in pops of colour. I don’t own a club tie, as I’m not in an elite or sporting circle, but I do really want one. Edward Sexton’s iteration is fun and playful, with summery hues courtesy of the sky blue and daffodil yellow stripes. The navy, green and white in the tie gives it versatility, so it will pair well with the majority of jacketing colours. Most of my tailoring is either navy or in varying shades of grey, so I’m keen on Sciamat’s double-breasted herringbone jacket, which is cut in a sumptuous forest green wool, as it will add a new dimension to my wardrobe. The shoulder isn’t as pronounced as the house's hopsack blazer, so it’s much more approachable on that front. I’d anchor the two with a tab collar shirt from Edward Sexton, which will keep the colourful tie neatly in place – with a proper dimple, of course. As we transition our wardrobes from the rich and heavy hues of autumn to the bright yet calming colours of spring, I like to use this uncertain weather to my advantage by merging the two together. New & Lingwood offers a delectable collection of bold pocket squares and by tucking a paisley patterned turquoise and pink version into a well-tailored Rubinacci navy blazer, you instantly create a talking point. Round off this simple look with a lightweight, yet insulating, roll neck from Anderson & Sheppard, as this will mitigate the need to add an extra layer. It's always refreshing to see someone confidently incorporating some colour into an ensemble. Take this white and yellow stripe shirt by Cordone 1956 – hand-crafted in Italy from pure cotton, the shirt features a single barrel cuff and a unique Napoli collar, while its candy cane stripe will keep your look light and jovial. The key, however, is not to overdo it, so balance the colour with neutral shades such as Rubinacci’s beige pleated cotton trousers and Ludwig Reiter’s black leather penny loafers.